THEN Farmers Gastropub will use 100% of profit earned, above an average Wednesday night, towards their hydroponic greenhouse budget. 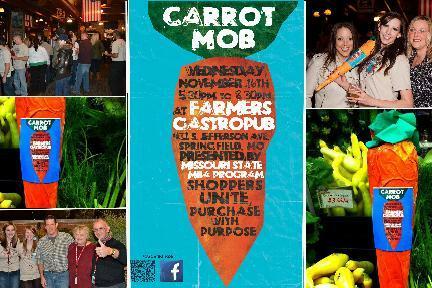 The very first Carrotmob in Springfield MO was organized by Missouri State University's MBA Program. A group of students from the program's core marketing seminar class lead the organizing efforts with the backing of the Dean of College of Business, Associate Dean, and Marketing professor. The Carrotmob movement fit perfectly with the university's public affairs mission, community engagement initiatives, and socially responsible leadership objectives. The campaign was featured on prime time local news spots, featured in the Springfield Business Journal, and mentioned by the Springfield Area Chamber of Commerce. Community and social media feedback have been positively overwhelming! We anticipate great Carrotmob longevity in Springfield and hope the MSU MBA Program will continue organization of the mob as part of the program.